By Xah Lee. Date: 2008-12-01 . Last updated: 2012-01-25 . 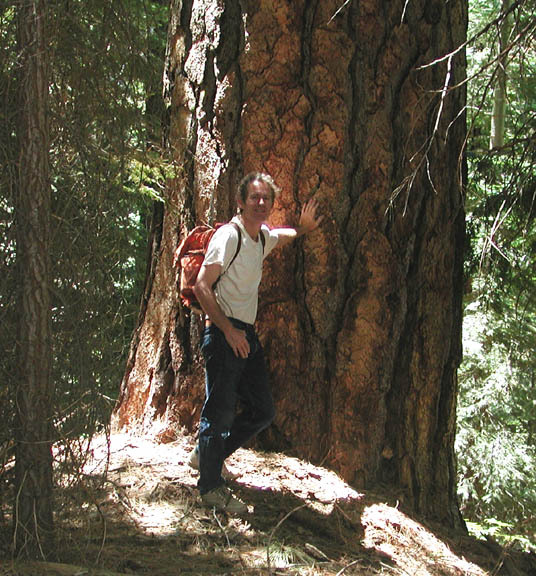 Today i learned that a mathematician friend, Russell Towle (1949 to 2008), has died. A photo of Russell Towle, he sent to me. I've never met Russell in person. We met online in around 1997, and have exchanged emails since. He was heavily into studying what's called Zonotope. I recall, he's very proud of H S M Coxeter's book Regular Polytopes Buy at amazon. In one or two of his email, he was trying to teach me zenohedron. At the time, i was deeply buried in studying mathematics, geometry, and Mathematica, and feeling myself being a big shot in programing Mathematica (partly because i just worked at Wolfram). He often had questions about programing Mathematica, apparently he's not a professional programer, and now and then asked questions in “comp.soft-sys.math.mathematica”. One of his problem is to program zenohedron generation by some growth method. To this day, i still haven't studied or know what zenohedron is, nor have i studied regular polytopes in any detail. He had a problem of how to remove duplicate faces or rhombuses in his growth, and i gave him a code that turns out to be the fastest. We exchanged email often then, maybe a few per month. But after a few years i got busy during dot com days around 1998 to 2002, and we haven't exchanged email much but perhaps not even once a year. After 2003, we have exchanged email maybe 4 or so times, and i was happy that he told me that he still uses my code and it is still the fastest. I recall then, he is also fond of the 3D modeling and rendering software povray. At the time, i didn't know nothing of povray. Though, i did learn it in 2006 and wrote some introductory tutorial: Intro to 3D Geometry Programing. Another impression i had of Russel, is that during our heavy exchange of emails discussing mostly math and programing in about 1997, he told me he actually never learned calculus. If i recall correctly, he expressed it candidly that he has no idea what it is. That's kinda odd, but it somewhat lowered my esteem for his knowledge. I recall telling him he should pickup some basic idea or something like that. You know, how online people hardly knew anything of each other. Unlike today, where everyone's got digital cams, web cams, instant messaging, voice chat, youtube, cellphone, but back in 1990s online acquaintance is mostly email exchange. And among programers who met online, the discussions seldom went over anything social or personal, partly because writing email for socializing is quite inefficient. A common saying is that on the internet you don't know the other is a dog. So, i didn't know anything about Russell, except that he does some zenohedrons and is a hobbyist Mathematica programer. But i do realize that in this digital age, there are really a lot new discoveries in math made by amateurs from nowhere. Except hearing zonotobe from him, i've never seen the word or heard it from anywhere else. As years went on, later i also learned from websites, that apparently he published about zenohedron in one of the journal of Mathematica. 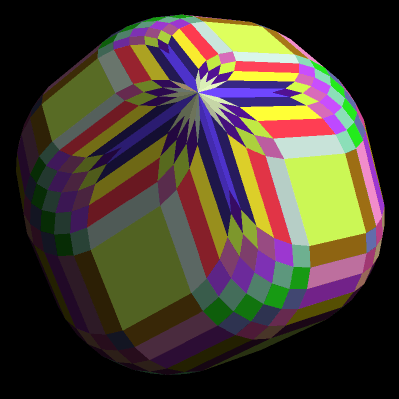 (I think in 2 issues, at least one of them used his zenohedron as cover illustration) I also learned from other websites, especially Mark Newbold (another online math acquaintance, who is a expert of polytopes, and wrote the famous Java applet to view hyperstars). I learned that Mark also knew Russel. 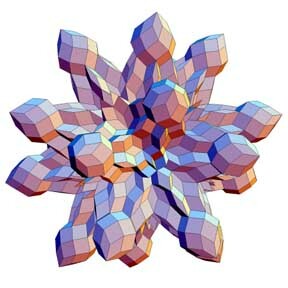 From Mark's mentioning of Russell, apparently Russel is a expert in zenohedrons. In around 2005, i was homeless vagrant, and thought of visiting Russell. However, due to my low self esteem, i never went thru it. Ah, damn, i recall i actually told Russell that i'm going to call him, but never did. Long live Russell Towle. You are a great spirit. I will always remember you and zonoheron. Best wishes to Russell's family. 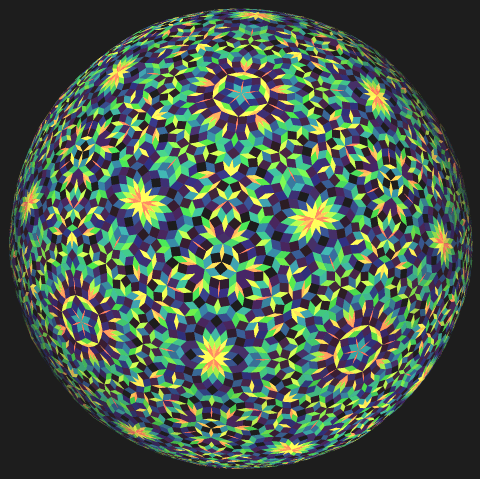 Russell Towle's 4D Star Polytope Animations @ http://dogfeathers.com/towle/star.html.